The origin of uncultivated coffee dates back to the 10th century in Ethiopia. Documented evidence of cultivation and coffee drinking is from the 15th century, in the Sufi monasteries of Yemen. By the 16th century, it had reached the rest of the Middle East, South India, Persia, Turkey, Horn of Africa, and northern Africa. Coffee then spread to the Balkans, Italy and to the rest of Europe, to South East Asia and then to America. 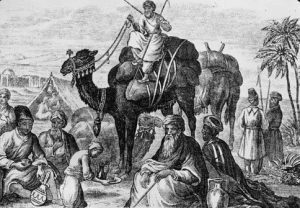 Introduction of coffee to India is credited to Baba Budan, a 16th century Sufi saint. He is said to have smuggled in raw beans from the port of Mocha in Yemen, while coming back from the Haj. In those days coffee was exported to other parts of the world in roasted or baked form so that no one could grow their own and were forced to buy from the Yemenis. On his return home, he planted the beans on the slopes of the Chandragiri Hills in Karnataka. This hill range was later named after him as the Baba Budan Hills, where his tomb can be visited by taking a short trip from Chikmagalur. Coffee production in India is dominated in the hill tracts of the South Indian states of Karnataka, Kerala and Tamil Nadu, accounting for 98% of production. Majority of the growers are small farmers with average estates of 5 acres. “Arabica” is the dominant variety grown in higher elevations, and “Robusta” is the variety grown at lower elevations. 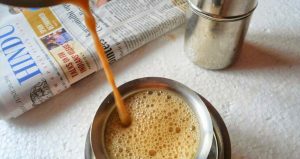 Coffee drinking is still mostly a domestic activity in India, and is the harbinger of a good morning in homes across south India. The tradition of coffee shops began in the 30s when the Coffee Cess committee opened their first outlet in Mumbai. Prior to this, the coffee houses were open only to the British and not to Indians. A number of them were soon opened all over the subcontinent. Many of them served as meeting spaces for people involved in the Independence movement. Thus began the saga of the iconic “Indian Coffee House” chain. The Coffee Cess board shut them down in the 50s. They were taken over by the communist leader A.K Gopalan and reopened as worker owned cooperatives across the country. Read this lovely write-up in the Slate magazine on Indian Coffee House. My favourite is the one in Kolkata, with a life-size photograph of a handsome Rabindranath Tagore in his twenties. The place was frequented by Netaji Bose, Tagore, and later by luminaries like Satyajit Ray, Amartya Sen, and Aparna Sen. The famous singer Manna Dey composed a song reminiscing his youthful days hanging out with friends here. Listen to it here. 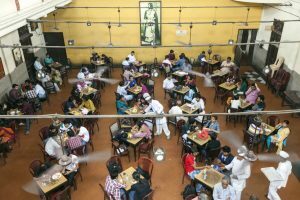 Decades later, the opening of the first Café Coffee Day in Bengaluru in 1996 paved the way for an explosion of the western style fancy coffee shops. Daana’s Coffee is from the Irula and Kurumba tribal communities in the bio-reserve of the Nilgiri Hills in Tamil Nadu. Soundararaj, one of the members of the community is featured in the above video. Keystone Foundation has been working for more than 25 years to help establish livelhoods for the tribal communities, and ensure continuation of their traditional ways of life. Read more about the community, the region and Keystone foundation’s work in my trip report. This is a Single Estate Arabica coffee, with no blends. Arabica coffee tends to be less acidic, and lends well for both filter coffee as well as for espresso. It is grown under the shade of native trees which provide a sanctuary for birds and other animals. This diverse ecosystem enhances the quality of natural organic matter in the soil and eliminates the need for chemical fertilizers. Shade trees also control the growth of weeds on the estates and reduce insect and pest damage, and leaf disease, thus eliminating the need for chemical pesticides. Growing coffee in high-diversity shade remains the most Eco-friendly cultivation method. India is one of the very few regions of the world where coffee is grown in dense and diverse shade. Here, coffee plants are grown among other plants such as oranges, tangerines, cinnamon, cardamom, nutmeg, cloves, and pepper vines, thus resulting in a unique and irreproducible flavour and character in every cup. The beans are handpicked to make sure that only fully ripe beans are harvested. Under-ripe beans are allowed to remain on the plants and ripen further. This selective, manual picking ensures that the beans are at the peak of flavor when picked. They are then sun-dried. Although this process takes much longer than mechanical drying, the slower drying period enhances the flavor in the beans. For the best filter coffee, add 4 spoons of powder and 1/2 cup water for enough decoction to serve 3 cups of coffee. Watch this video for an easy step by step guide on making your morning elixir. I love my coffee just the way she explains in the video, with all that froth on the top ! !